Veronica Lodge finally made her presence felt at Riverdale and as expected she came in like a wrecking ball. She totally has Archie under her spell. Mark Waid provides a very funny script that shows his increasing comfort level with teenage shenanigans. Sadly, issue #3 also marks the end of Fiona Staples' run but goes out in style with her signature emotive character work. The arrival of socialite and reality show star Veronica could have been a one-dimensional depiction, but instead she's allowed to be a fallible human being with more layers than usual. It doesn't hurt that Veronica has something over Archie, his destruction of her home's construction site wouldn't sit well with her dad if he knew, but he's more than eager to help out the new student. This doesn't sit well with Jughead who sees right through Archie. He spends the issue trying to snap Archie out of his servitude to Veronica. He even enlists Betty to help. Some funny mischief ensues, but Waid finds a moment of pathos in an unexpected way. After the school's cafeteria food doesn't agree with Veronica causing a mortifying scene brilliantly illustrated by Staples in a splash page, she retreats tearfully into the restroom. Feeling overwhelmed with embarrassment she calls her dad and explains she doesn't understand why the kids treat her in such a polarizing way. Betty's in one of the stalls and hears her distress. She helps Veronica clean herself up and the distinction between the legendary "frenemies" is as clear as ever. They share a moment where Betty is ever caring and Veronica displays a vulnerability that betrays her aloofness. By the end, it doesn't remain so congenial but something more was established beyond some ridiculous love triangle. Staples' talent is undeniable and ever present. So much of the story and its emotions are told through the expressions of the characters and their body language. The look of shocking humiliation on Veronica after her lunchtime incident is cringe-worthy for its relatable horror. Jughead's side-eye he gives to Archie expresses so much incredulous distrust it speaks volumes in its execution. Staples is a master of depicting human nature even in the wildest of situations. Andre Szymanowicz and Jen Vaughn provide wonderfully bright colors, keeping the focal point on the lead characters with contrasting hues. The attention to detail is impressive by portraying the fashions and hairstyles as contemporary as possible. 'Archie' #3 is another reminder that rebooting the iconic comic could be fresh and entertaining while adding depth and nuance. Even the well-worn love triangle between Archie/Betty/Veronica is reconstructed devoid of platitudes. Waid and Staples have tapped into what makes the Riverdale experience so relatable to its readers. At its center is the emotional toll that being young takes and how that manifests in actions, usually in hilarity. 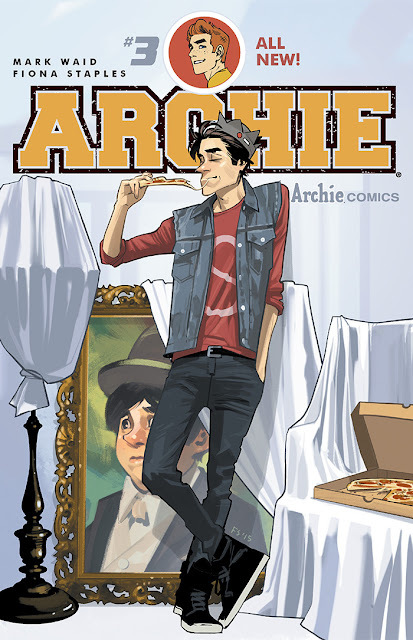 Despite the loss of Staples moving forward, 'Archie' will continue to take readers on a hilarious journey with friends they continue to rediscover.